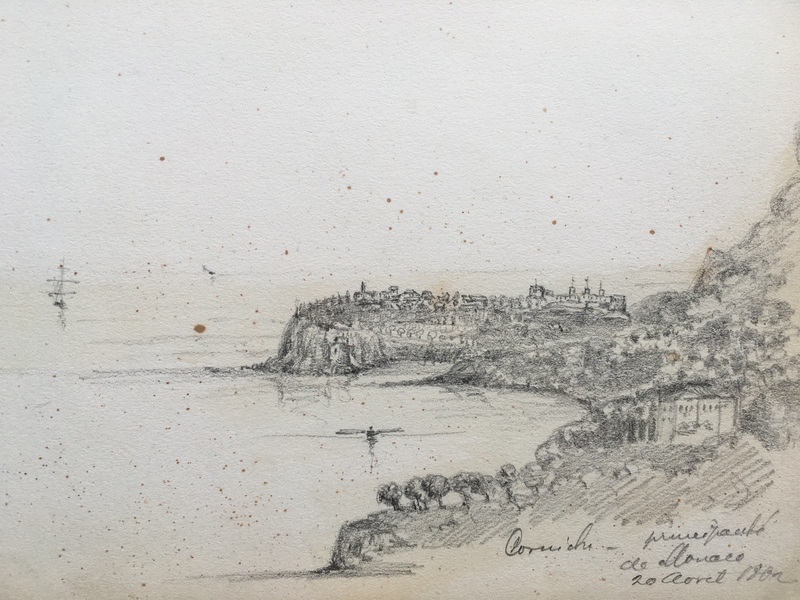 In 1862 a young man named Oscar Andreae travelled to Italy, stopping en route in Nimes, Tarascon, Toulon, Cagnes and Nice, where in April 1862 he sketched a bird’s eye view of the Port of Nice (right), the rocks and the old chateau seen from Mont Alban. The Fort of Mont Alban was constructed in the 16th century to stave off a combined Franco-Ottoman army; for Nice was then ruled by the Dukes of Savoy and – bar a few decades under Napoleonic rule from 1792 to 1814 – it was in effect ‘Italian’ (part of the Kingdom of Piedmont-Sardinia) until 1860, only two years before Andreae visited the city. The Treaty of Turin was signed in 1860 by the Sardinian king and Napoleon III, ceding the city to France in return for help in the wars of Italian Unification against Austria. Looking the other way from this fortification one sees the Gulf of Villefranche, the Bay of St Jean and the Corniche, the route that snakes its way along this spectacular rocky coastline (left). 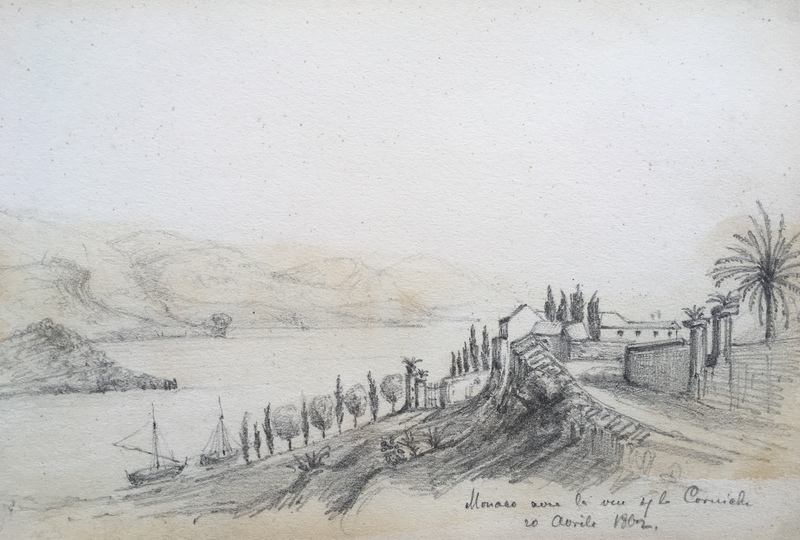 In view of the recent secession, both French and Italian names are used interchangeably by Andreae, with this sketch (below) entitled ‘Villafranca 18 April 1862’ and the inscription opposite noting ‘Port de Villefranche avec la fregatte russe’. 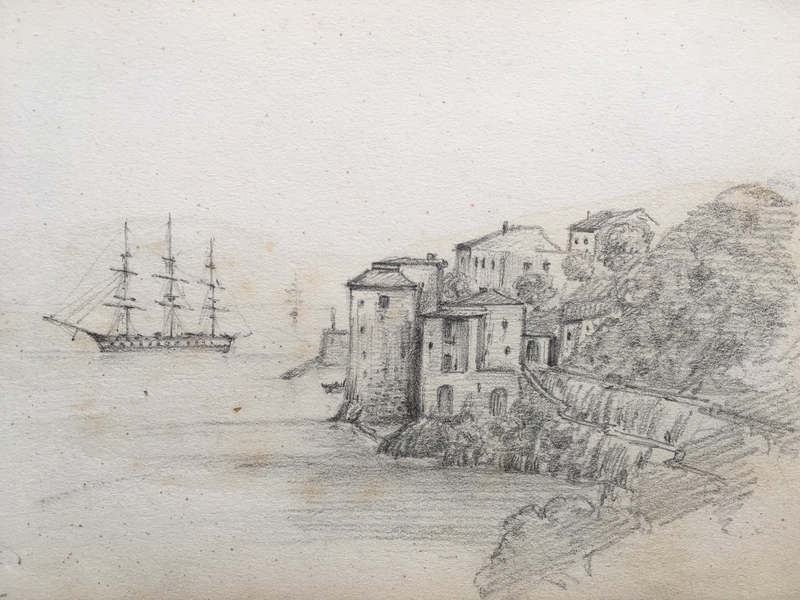 One of the deepest natural harbours on the Mediterranean, Villefranche became an important Russian naval base in the late 19th century. 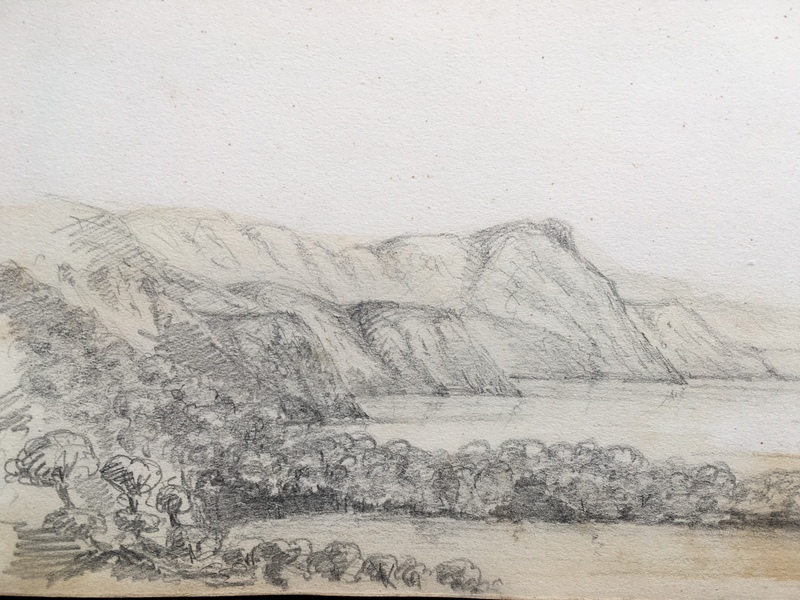 The Corniche leads on to Monaco, where Andreae sketches the new principality’s position on a rocky promontory (right and below). 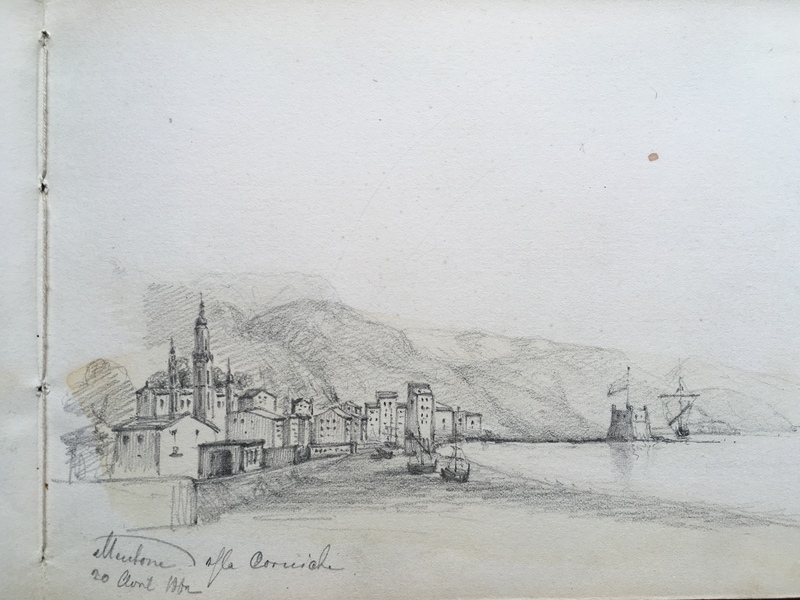 Monaco had been a protectorate of the Kingdom of Sardinia for much of the 19th century; the Franco-Monegasque Treaty of 1861 – a year before Andreae’s tour – confirmed Monaco’s sovereignty. The glamour and wealth we associate with Monaco today is nowhere to be seen in this image of a provincial coastal town – however, the famous Monte Carlo Casino was to open the following year, in 1863. 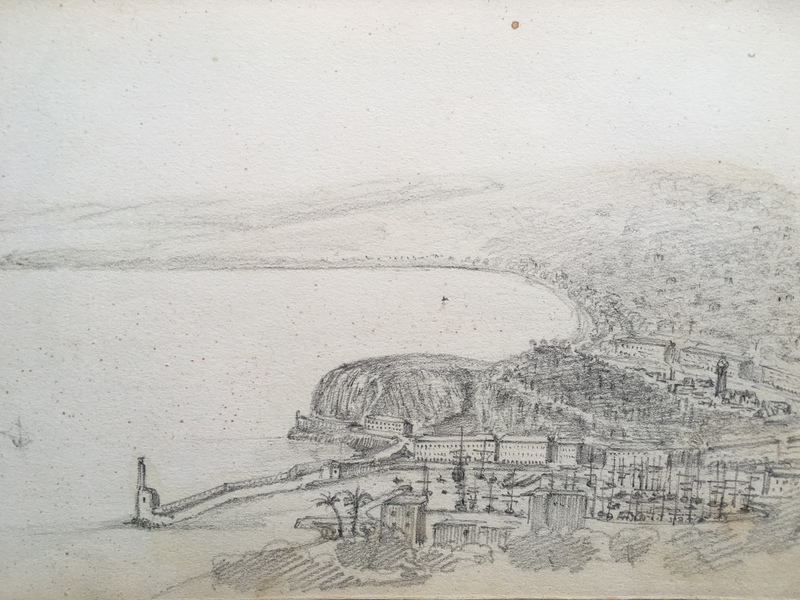 Menton (below), being in the County of Nice, was also annexed by France in the Treaty of Turin. 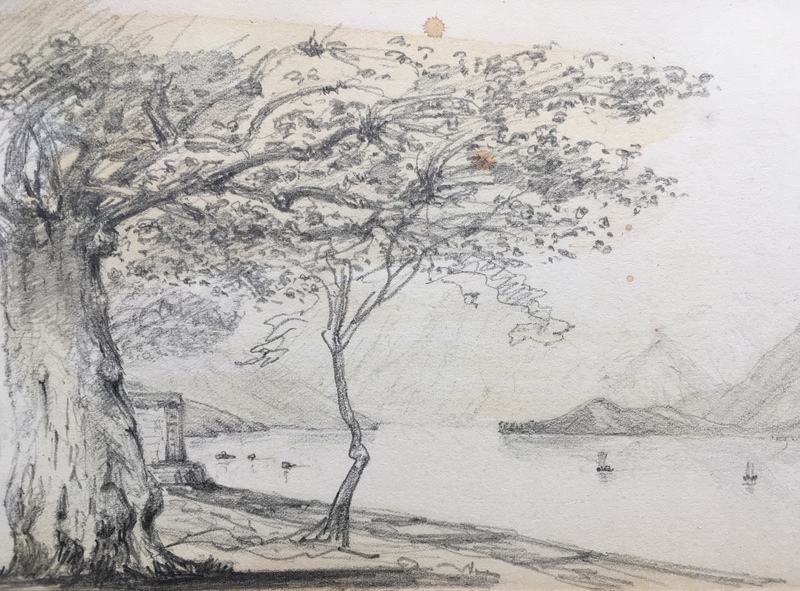 At this time it was quickly becoming a popular destination for convalescents, following the 1861 publication of ‘Winter and Spring on the Shores of the Mediterranean’ by Dr. James Henry Bennet, whose tuberculosis was miraculously cured by spending those seasons in Menton. 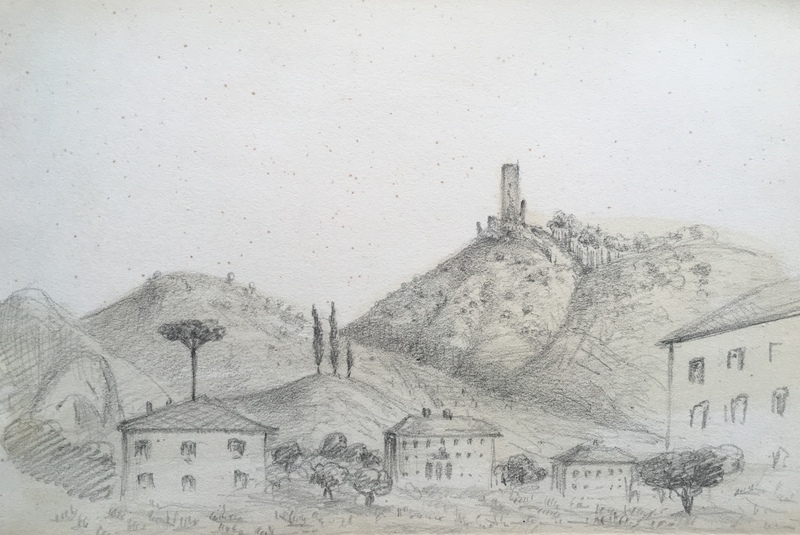 And then in March 1862 Andreae reaches the newly unified Italy. Victor Emmanuel had been proclaimed King on 17th March 1861 and Rome declared the capital ten days later. However, Rome was still not officially part of Italy, remaining under the control of the Pope (with the protection of Napoleon III). Just over a year after Andreae’s visit, the anti-Catholic Garibaldi would reappear from his brief obscurity on the island of Caprera to organise an ultimately unsuccessful march on Rome. 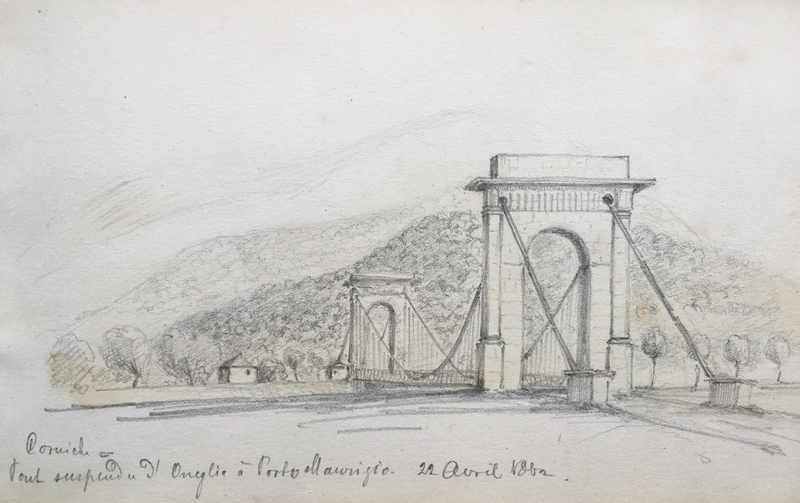 The first stop was Porto Maurizio (now part of the city of Imperia, created by Mussolini) where Andreae sketches the Ponte d’Oneglia (left), a suspension bridge across the Impero. 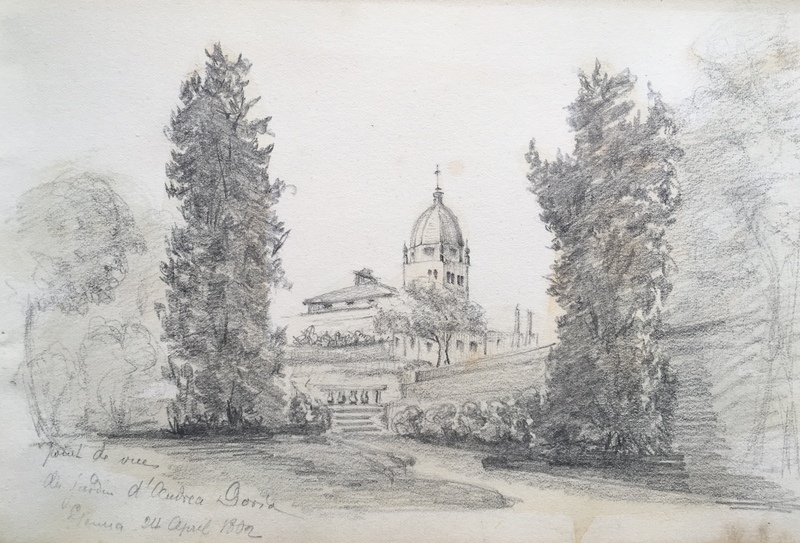 Along the coast in Genoa he sketches the lighthouse or lanterna (right) – a symbol of the city’s maritime connections and for many centuries the tallest lighthouse in the world – and the gardens of Andrea Doria (below left), a Genoese condottieri and admiral of the 15th-16th centuries. 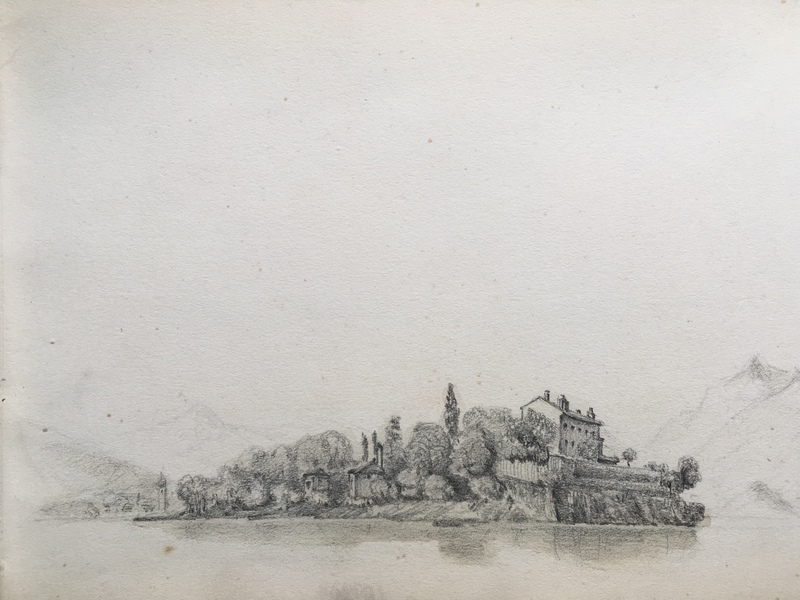 Then he heads to the lakes, stopping beneath a tree near Bellagio to sketch a view of Lake Como (below centre). 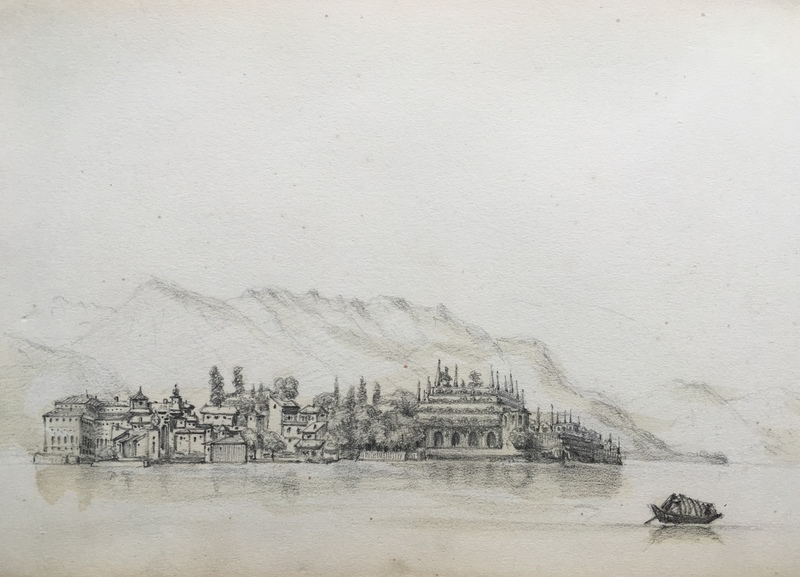 In the early 19th century Bellagio had become popular with the Milanese nobility after Count Melzi d’Eril, Duke of Lodi and chancellor of Napoleon’s Kingdom of Italy, built a luxurious summer villa there. 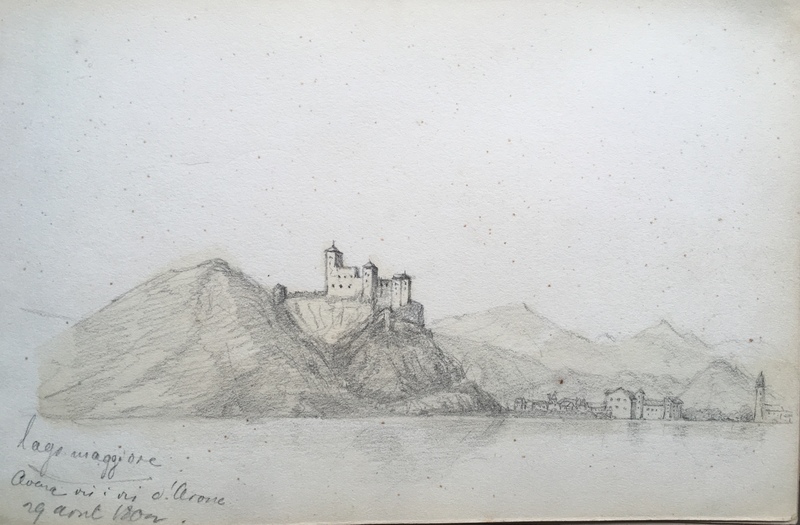 A view of Arona on Lake Maggiore shows the majestic castle, la Rocca di Angera, atop a rocky promontory with the town strung out along the shore beyond (left). 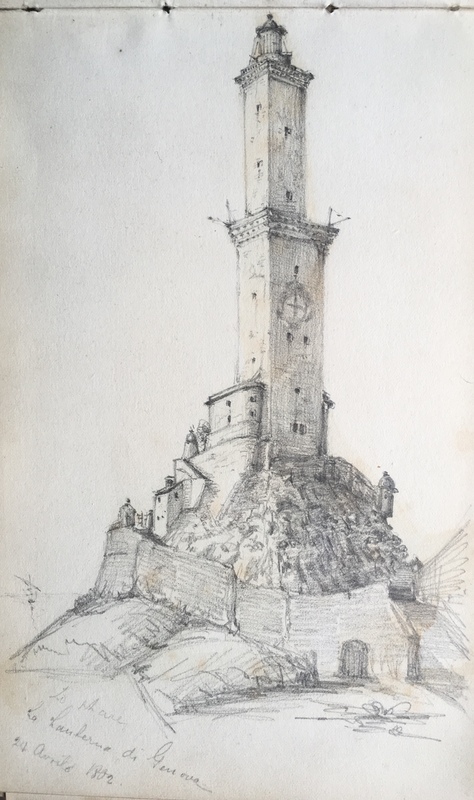 The castle is owned by the Borromeo family, originally merchants who set up a bank in Milan. In 1446 Vitaliano Borromeo became Count of Arona, while in the 16th century his descendant, Carlo Borromeo, became a cardinal, then Archbishop of Milan and was eventually canonised. 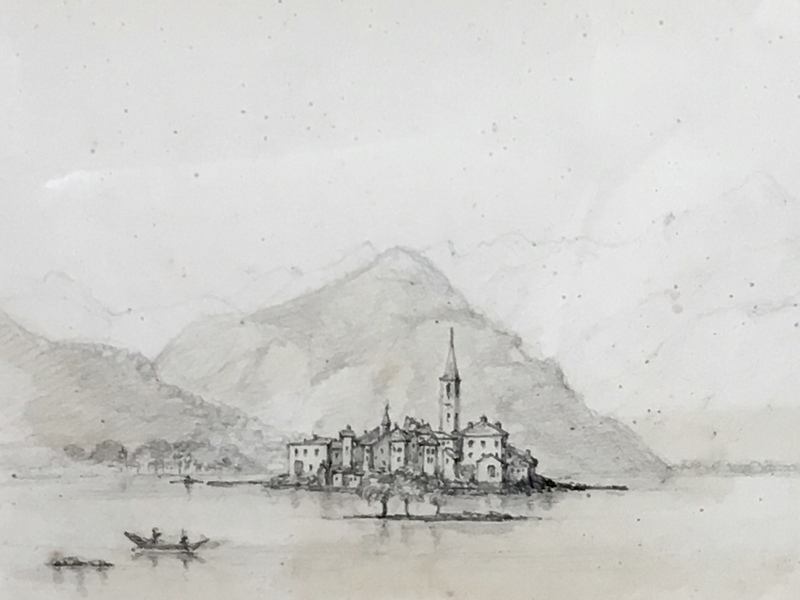 The Borromean Islands – the Isola Bella, Isola Pescatori & Isola Madre, which Andreae sketches from a boat (below) – have been in the family since the 16th century, the palace and famous terraced gardens (complete with white peacocks) of the Isola Bella built in the 17th century. Floating on the mirror-like surface of the lake, they appear as a beautiful dream, as they still do today.